This image shows that it is possible to create a laser machine in a 19" rack format - which is ideal when floor space is a premium. 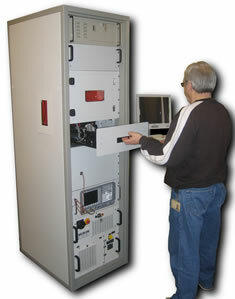 The system shown allows operators to load parts via a drawer. Using "Through The Lens" machine vision, the start point for the laser trimming is found to within 10 microns. This particular system uses a 532nm Green Laser. Lasers can be used for a variety of cutting applications ranging from precision cutting paper-thin materials to quality cuts in 30mm thick steels. Also the laser beam can be used to drill very small to very large holes in various materials. At CS Automation we can supply bespoke solutions for trimming products or for accurate drilling of components, integrating the laser with the required motion control and vision systems.